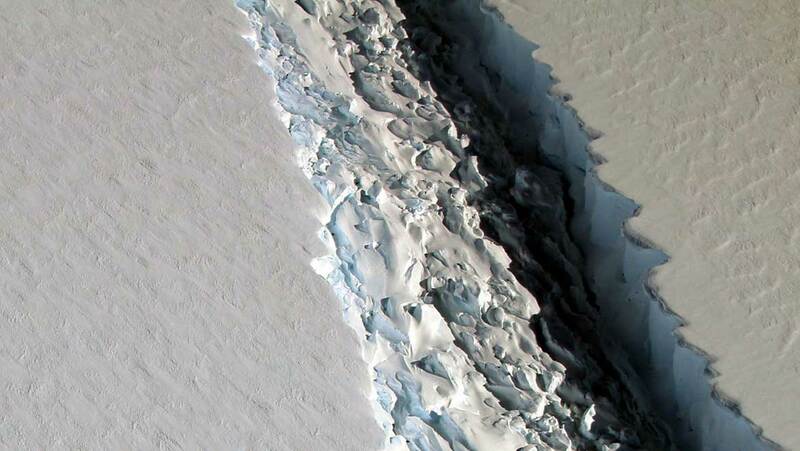 The huge iceberg set to break off, or ‘calve’ from Antarctica’s Larsen C Ice Shelf has finally broken away. Weighing in at one trillion tonnes and covering an area of around 5,800 square kilometres, it’s one of the largest icebergs ever seen and by breaking off it has significantly changed the Antarctic landscape. The progress of the rift between the main ice shelf and the iceberg has been closely monitored by Project MIDAS, an Antarctic research project focusing on the effects that our warming climate is having on the Larsen C Ice Shelf. Using a combination of fieldwork, satellite observation and computer simulations they are monitoring the changing structure of the ice and investigating what effect this may have. “We have been anticipating this event for months, and have been surprised how long it took for the rift to break through the final few kilometres of ice. We will continue to monitor both the impact of this calving event on the Larsen C Ice Shelf, and the fate of this huge iceberg. The iceberg is one of the largest recorded and its future progress is difficult to predict. It may remain in one piece but is more likely to break into fragments. Some of the ice may remain in the area for decades, while parts of the iceberg may drift north into warmer waters.